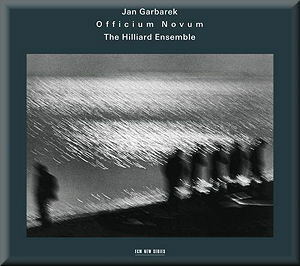 This is the third ECM album in which Jan Garbarek and the Hilliard Ensemble have collaborated. These recordings have seen an artistic development in whose line Officium novum follows with further interesting inroads into new musical fields. The first album, Officium was a confluence of the ancient and the new in terms of performance – early music ranging from the medieval to the 16th century, with an improvisatory element from Garbarek’s saxophone. This was followed by the double album Mnemosyne in 1998, which took not only the approach to the material but the material itself more into the present, incorporating modern compositions amongst the early music repertoire. Like the previous recordings, Officium novum has been recorded in the rich acoustic of the St Gerold monastery, but this time the central axis of the programme is based on music from Armenia. The musicians’ source for this material is derived from music collected by Komitas Vardapet (1869-1935), a priest and musicologist who preserved the medieval liturgical music of the Armenian church, tracing its roots to folk music and bardic tradition of the Caucasus. The Hilliard Ensemble studied these pieces while visiting Armenia, and they form the backbone of a programme which once again combines ancient and modern works. Fans of the Hilliard/Garbarek combination will pretty much know what to expect, and by all accounts can’t get enough – this album already having soared high in the charts on its release. For those coming to this afresh, the effect is quite hard to sum up in a few words and is rather more open to subjective reception than one might imagine. The Hilliard Ensemble’s vocal quartet has a fine homogeny, though distinctive in its counter-tenor led sonorities. Over their mellifluous tones the saxophonist extemporises; illustrating, enhancing and commenting on the pieces in musical terms. There are some who might consider Jan Garbarek’s saxophone something of an intrusion – a saw-fly buzzing around such finely turned vocal artistry. Indeed, this entire project has always given the impression more of the solo improviser flying freely – within boundaries which become clearer the more you listen – over pre-existing music apparently immune to the added dimensions of the saxophone. This is all very fine, but how does it come together to create something new? This is the alchemy of the improviser. When everything works, the result is always more than the sum of its parts. The first track is in fact one of the best on this CD, the saxophone creating its melodic atmosphere over rising, advancing voices. The sense of something arranged specifically rather than just set up for a free solo over the top of a soft choral bed is very promising. This Ov zarmanali or ‘Hymn at the baptism of Christ’ has plenty of those Armenian harmonies which were mentioned earlier, creating strange dissonance through raised or lowered notes in scales which differ to the more familiar ‘mean tempered’ major/minor keys of later European tradition. Jan Garbarek’s saxophone is sometimes a bit forward in the balance, even when he is being low and restrained such as in the Byzantine Svjete tihij. Garbarek has composed his own music for this recording, and Alltin finns and We are the stars are both interesting contributions, but more lushly close-harmony/barbershop than most of the other music here. The substantial Litany is a trilogy of pieces which allows space for solos both sung and played, and works very nicely – the larger canvas give the music a chance to spread and develop. Surb, surb is one of those Armenian pieces which is magical in its simplicity, and Garbarek hangs a garland of appropriately placed notes on it without altering the mood from the voices. Central in the programme is a sax-free version of Arvo Pärt’s Most Holy Mother of God, which as you might imagine, fits in chameleon-like with both the ancient and modern pieces. Garbarek joins in with the melody for parts of the Spanish Tres morillas m’enamoram, which is a nice effect and a springboard for some elaborate improvisation. The two Armenian pieces Sirt im sasani and Hays hark nviranats ukhti, a hymn for the beginning of the traditional mass while incense is being spread, are quite a highlight, and form a trilogy with the sense of resolution in Pérotin’s Alleluia Nativitas which ends with a festive feel. The programme concludes with a short poem, ‘A little farther’ by Giorgos Seferis. This is a strange appendage, and not entirely necessary as part of the recorded programme if appropriate in sentiment. At only 19 seconds it is however little more than an odd punctuation mark at the end of a moving journey. This is another ECM classic presentation, with stunning photographs in the booklet by Mario Giacomelli and useful notes by Thomas Steinfeld. Whatever anybody says about it, this is the kind of evergreen money earner which allows a label like ECM to broaden all our horizons with less immediately popular but almost invariably stimulating and unusual programmes. Don’t get me wrong – this is all wonderful stuff and any further comments are more observations rather than criticisms. Inevitably, what you have here is ‘Hilliard Ensemble’ in terms of vocal sonority, rather than any approximation of the rather more impassioned style of some Armenian singers and choirs. Other than exploration of different repertoire the essential differences between the Hilliard/Garbarek collaboration’s recordings are relatively few, and the risk of turning a winning ‘if it ain’t broke don’t fix it’ creative team into something formulaic and predictable is ever present. Music improvisation is a self-fuelling art form if it has a sense of urgency and ever-changing edginess – the feel of having to move forward, otherwise you sink. By this I do not mean it can’t inhabit this kind of spiritually refreshing and ‘safe’ world, but I miss the feel of innovation and growth in the albums which followed the original Officium concept, innovation which exploration of different repertoire doesn’t really cover when the sonorities and gestures are pretty much all the same. I’m not asking much, just a little bit of scrunch to go with the niceness, a subtle shift beyond high quality ‘more please’ musical comfort food. Maybe some subtle remixing and treatment to create a momentary ‘Garbarek choir’, or a whiff of the shimmering baroque organ sounds Keith Jarrett made on ‘Hymns - Spheres’? I love ‘ooooh’ and enjoy plenty of ‘aaaah’, but don’t all great albums have at least one moment where the ground turns transparent beneath your feet and you get a big dollop of ‘woooow’?